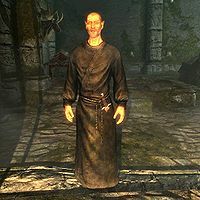 Kornalus Frey is an Altmer warlock who can be found in the ruined fort of Harmugstahl, conducting disturbing experiments on the unfortunate frostbite spiders residing there. When you approach him, he will confront you, saying, "What? How did you get this far? ", before attacking you. He wears Black Mage Robes and Black Mage Boots, and carries a dagger of up to Elven quality. Kornalus' physical appearance is randomly generated; he may look different in each playthrough. The key Kornalus holds is called Kornalus Frey's key. There is no known connection between him and Mercer Frey. A slightly longer conversation can be seen in the game data, but appears to have been removed in the final version. Kornalus would have confronted you, saying, "What? Who are you? How did you get this far?" You could have then replied, "Your weird experiments are over, wizard." After which, he would have coldly threatened you with "Your corpse will feed my spiders for weeks. Now die, you fool!" and then attacked.